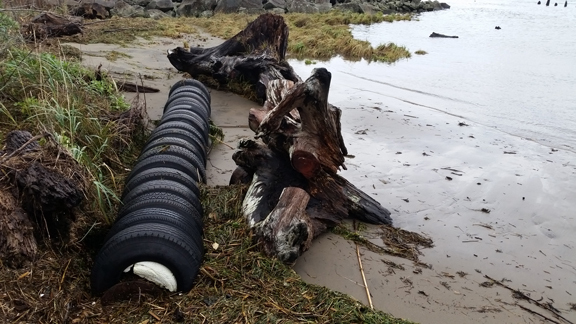 The Lower Columbia Estuary Partnership began tracking marine debris in the lower Columbia River in 2016. Specifically, we're tracking small to medium size marine debris (less than 35-feet) from the Pacific Ocean to the Bonneville Dam. This typically includes things like tires, barrels, styrofoam blocks, small boats, derelict structures, fishing gear, etc., or other materials that may harm recreational resources, habitats, and species. A) Report debris using our Marine Debris Reporting WebApp. This may be easiest if you have a device with an internet connection. B) Report debris using our Marine Debris Submittal Form below. This may be easiest if a device with an internet connection is not available, and/or if you know the exact lat/lon coordinates. Please use one of these to report any known occurrences of items listed above (or similar). We will review the information, and add it to our Marine Debris Tracker WebApp if it is not already mapped. This marine debris tracking data will help us quantify the amount, type, and location of marine debris - and to develop clean-up projects. In addition to describing the object, please include a brief description of the approximate location, if lat/lon coordinates cannot be provided. 5 MB maximum. GIF, JPG or PNG files only.